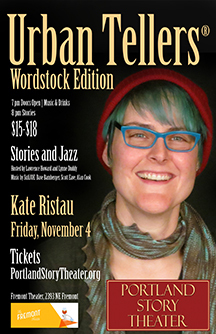 As part of Wordstock, I was invited to join Portland Story Theater for a special performance — Urban Tellers® Wordstock Edition. I had no idea what I was getting myself into. It wasn’t just one performance; it was a series of workshops led by Lawrence Howard and Lynne Duddy. We started out by getting to know each other. I had the pleasure of working with Gigi Rosenberg, Rachel Miller-Howard, Jamie Houghton, and Jessica Tyner Mehta. Each of these women are excellent writers and profound storytellers. Throughout the workshop, I had a chance to hear their stories develop, and each evening took me deeper into my own narrative. Lawrence and Lynne worked with us on the shape and the meaning behind our stories. They taught us to look for the moments that mattered, and to tease out the truth. As a folklorist, I study stories. 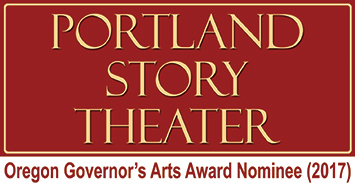 But I’ve seldom had so much time to truly consider my own work — to consider the transformative power of story. I chose to tell the story of my son, and how, since he was born, our plans have constantly changed. Throughout the workshop, I thought about the story I wanted to tell, and the story I want my son to have. The story changed throughout the workshop, but I think I finally told the one I want him to hear when he grows up. Let me know what you think. And if you enjoy it, stop by Portland Story Theater’s next show… or join them on your own journey through the power of story.